Taking his inspiration from biographical facts, novelist Colum McCann tells the erotically charged story of the Russian dancer Rudolf Nureyev through the cast of those who knew him: there is Anna Vasileva, Rudi's first ballet teacher, who rescues her protégé from the stunted life of his provincial town; Yulia, whose sexual and artistic ambitions are thwarted by her Soviet-sanctioned marriage; and Victor, the Venezuelan street hustler, who reveals the lurid underside of the gay celebrity set. 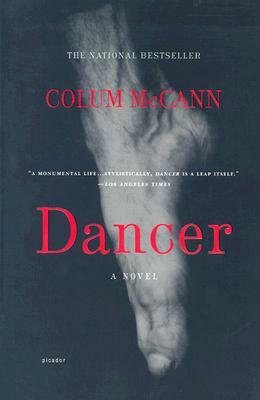 Spanning four decades and many worlds, from the horrors of the Second World War to the wild abandon of New York in the eighties, Dancer is peopled by a large cast of characters, obscure and famous: doormen and shoemakers, nurses and translators, Margot Fonteyn, Eric Bruhn and John Lennon. And at the heart of the spectacle stands the artist himself, willful, lustful, and driven by a never-to-be-met need for perfection. Colum McCann is the author of books including "This Side of Brightness," "Zoli," "Songdogs" and "Let the Great World Spin." He has received the International IMPAC Dublin Literary Award, a Pushcart Prize, and was named the first winner of the Grace Kelly Memorial Foundation Award and the Princess Grace Memorial Literary Award. He lives in New York City.